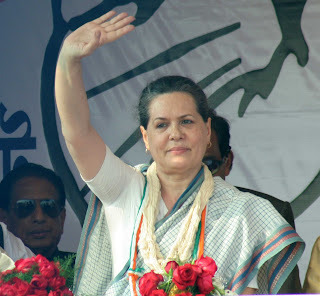 Addressing her first election rally in Bihar, Congress President Sonia Gandhi today attacked erstwhile ally , Lalu Yadav’s Rashtriya Janata Dal ( RJD), and reminded people of RJD’s poor record of governance in the state. “ The less said the better about those dark days,” she declared in an unusually hard-hitting speech. Referring to the Third Front led by the Left Front and the Fourth Front comprising Lalu Prasad, Mulayam Singh Yadav and Ram Vilas Paswan, she said it had become fashionable to launch fronts. “ God knows how many more fronts would come into existence to oppose Congress,” she exclaimed. “Jitney morcha, utney neta, aur jitney neta, utney pradhan mantri”, she declared and cautioned people against selfish politicians who are out to grab power. “ Serving people is certainly not their motto,” she added. Hate speeches and offensive rhetoric are in vogue this election season as the latest one from MDMK leader Vaiko hits the Election Commission . Vaiko has threatened the Tamil Nadu government of a "bloodbath in South India" if LTTE chief Prabhakaran was harmed. 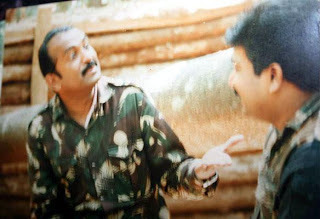 Using the waning battle as a poll plank in Sri Lanka, he said, "If anything happens to LTTE leader V Prabakaran, there will be a bloodbath in Tamil Nadu." 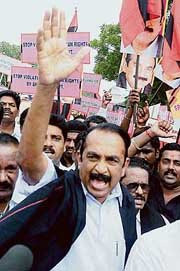 Vaiko was arrested by the AIADMK government in 2004, under the anti-terror law POTA for his pro-LTTE speech. In a second incident of its kind in a week, a retired school teacher on Friday hurled his shoe towards Congress MP Navin Jindal in Kurukshetra "to protest" against Congress' policies but missed his target. Ram Kumar threw his shoe towards Jindal during an election rally in Kurukshetra constituency, police sources said in Kurukshetra. 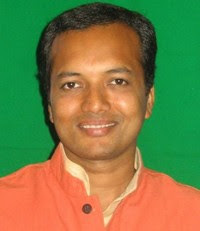 While throwing the shoe at Jindal, the retired teacher said he is doing so in to protest of the policies of the Congress. Police immediately took Kumar in its custody and whisked him out of the rally. Meanwhile, Jindal alleged that Kumar was under the influence of liquor. Mr. Jindal that poor man was not under the influence of liquor but you politician s are under the influence of "power", due to which you could'nt see the plight of a poor man, who find it hard to make the 2 ends meet. People will keep throwing shoes at you. coz otherwise even the young leaders are getting deaf like your old counterparts towards the poor condition of the poor of this country. I request my country men to throw these type of politicians out, but yes keep throwing shoes on them so that even others should learn from the incident & be ready to get humiliated. The Bharatiya Janata Party's star campaigner was in Faizabad on Sunday. But just outside Ayodhya, Narendra Modi avoided temple talk, focusing instead on development and terror. Is the party abandoning Ram? In these polls, the BJP will not raise political dust over the Ram temple. The BJP's Hindutva mascot, speaking barely 10 km from Ayodhya's disputed site, didn't say a word about the Ram temple. But he did make several references to Ram. Development and terror were the focus of Modi's speech. 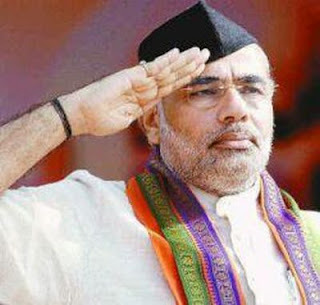 He boasted of the development in Gujarat, and mocked the UPA over its response to 26/11. He knows the Ram temple has stopped getting votes, even near the epicentre of the movement, Faizabad, where political disruptions have meant no development in the past two decades. In fact, the one time stringent Hindutva leader Vinay Katiyar has had to flee Faizabad, and contest this time from adjoining Ambedkar Nagar. The BJP cannot abandon Ram - for that there is Modi - now Varun Gandhi. Otherwise the BJP is not ready to be weighed down by baggage of the past. It benefitted from the backyard of mythology. Now it's chasing the frontier of real politics. 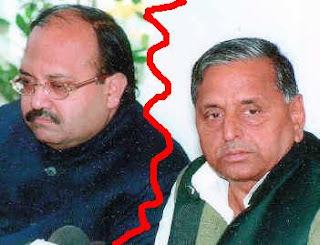 AMAR SINGH, A 24 HOUR OPERA HOUSE - Amar Singh threatens to quit SP, retracts..
"CLOSE on the heels of what was seeming to be a major flashpoint in the making, Samajwadi Party general secretary Amar Singh, who had threatened to quit the party over his differences with party colleague Azam Khan, climbed down from his belligerent posturing and said "everything is normal. "Talking to the mediapersons on Tuesday, shortly after his remarks in the backdrop of what he called "abuses" hurled at him by Azam Khan, which had suggested a rift in the party, Amar Singh said, "I can leave the world but I can't leave the party. "He clarified there were no more differences in the party over actress- turned-politician Jayaprada being fielded from Khan's hometown in Rampur.Earlier, the two senior leaders of SP had been locked in an uneasy Relationship, ever since Khan, an influential leader in western Uttar Pradesh, started campaigning against Jayaprada's candidature in Rampur from where she had won in 2004.Amar Singh said in the strongest remarks yet on his role in the SP, "I know where I stand. The day I feel I have had enough, I will say goodbye to Mulayamji and leave the party." Few Example of ILLITERATE, UNCIVILIZED Barking NETAS" Source, TOI, April 8. Shoe thrown at Chidambaram --- its a warning for all politician against anger growing in common man.. so wake up before a shoe thrown at you..
"NEW DELHI: An angry journalist threw a shoe at India's top security official after a confrontational exchange during a news conference over the 1984 anti-Sikh riots that left thousands dead. Before throwing the shoe, Singh asked Chidambaram several questions about the Central Bureau of Investigation's findings last week that cleared a senior Congress party leader, Jagdish Tytler, of involvement in the bloody riots that left 3,000 dead. Chidambaram said CBI was an independent body and that the government played no role in the decision. He called for the public to be patient. 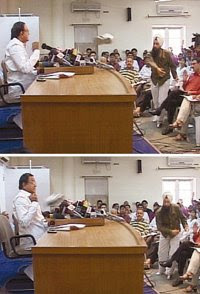 Soon after, Singh told TV reporters that he regretted throwing the shoe but felt Chidamb-aram was dodging the question. "I just wanted to ask him how justice will be done, but he was not interested in answering the questions." "
Jarnail singh after throwing the shoe said "I don't think it (throwing shoe")was the right way but the issue(1984 riots) was right". The whole incident if assessed again shows the confussion on part of National Parties like congress in giving ticket to criminals, whom althought the CBI(only agency which just investigates for zillion of years but never come up with the result & always been a toy in the hands of politicians) has cleared a convict but even internally congress knows whats been done & by whom. Its a moral question "how can you send a convict to public to seek their vote & posing another threat to them if he comes in power. The whole incident shows the anger in an ordinary man who got angry to see the home minister, who did'nt seem interested in answering the question on a very sensitive issue, thats been haunting a whole community for the almost 25 years now. Even the home minister know how lethargic the CBI is in dealing with any case & such an agency is nothing but a huge cost to the tax payers of the country coz they could never been a independent agency & always been a weapon in hands of ruling government against their rivals. Pls. Mr. chidambram & Ms. Sonia Gandhi, why can't you find a decent man out of a billion population to contest an election, that you have to give tickets to criminals & convicts who have been responsible for the killing of so many innocent. Shame on you guys.......... Friends let get together & SWEAR THAT WE WILL VOTE out such criminals. As Mr. Shiv Khera says " if we remain silent on seeing the injustice & atrocities being done on our neighbours, we are the next in the queue". Have you done something for the country, instead of just raising fingures at others?